Strangled by the Japanese blockade of its sea ports, and with its supplies from Russia diverted to combat Hitler's invasion in the South, China was left with but one lifeline for vital supplies from the outside world: A treacherous unpaved track hacked through mountain terrain linking the vital port of Rangoon with the city of Kunming, in South West China - it was the infamous Burma Road. With the Imperial Japanese air force hell-bent on destroying China's last supply link, opposition had almost evaporated but for a tiny 'air force' of American volunteers led by the indomitable figure of Claire Chennault. Formed in early 1941, many months before Pearl Harbor, a rag-tag bunch of 100 recruited flyers supported by 200 ground personnel, known officially as the American Volunteer Group came together to stand alone against the might of the Japanese air force in Indo-China. During their brief existence this remarkable group became one of the most successful and famous fighter units of all time. Blazing a trail in the skies over Burma and China they created a legend that will remain in the folklore of aviation history. They were Chennault's FLYING TIGERS. 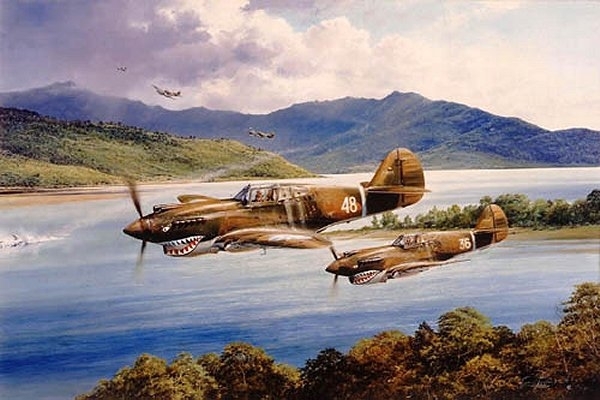 With little official support from home and almost without replacement aircraft or spares, the P-40 Tomahawk pilots of the AVG became the scourge of the Japanese air force and the heroes of the Chinese people. In a six month period of combat, with no more than 50 or 60 serviceable aircraft at anyone time, and almost always heavily outnumbered in the air, they destroyed some 300 Japanese aircraft, while probably damaging or destroying another 300, and caused incalculable damage to Japanese ground resources. Their brief, glorious existence came to an end when on July4, 1942 the AVG was absorbed into the U. S. Army Air Corps and Chennault's Flying Tigers passed into history. Moved by the exhilarating legend of the Flying Tigers, Robert Taylor has created one of his finest masterpieces. Capturing perfectly the spirit of the Flying Tigers "CHENNAULT'S FLYING TIGERS" portrays a scene typical of the distant war fought by this tiny band of warriors. Depicted in the foreground of Robert's dramatic and spectacular combat scene are two P-40 Tomahawks of the 2nd pursuit squadron, the 'Panda Bears', as they pull out of their diving attack just above the tree-tops of the Burmese jungle. One bomber hits the water, as two more P-40s bear down on another Nakajima bomber. In the distance the air is busy with low-level combat.